For the utilities, auto-switchers could trigger a migraine of their own. Auto-switchers are upstarts, claiming to be the consumer champion, and interposing themselves between the utility and its customers, replacing the chore of switching with the freedom that automation brings. The supplier’s brand disappears from the customer’s view, to be replaced by an effortless online agent that learns and models consumption patterns, carries out switching on the householder’s behalf, then monitors the market forever, looking for further opportunities to repeat the process. The customer’s experience is simpler, beneficial, positive – and far less hassle. A consumer's utopia? For some, possibly, but not all customers want to switch or even engage in switching at all. Many customers want to know who their suppliers are, just in case they have a problem, or simply, they just don't want to change all the time. 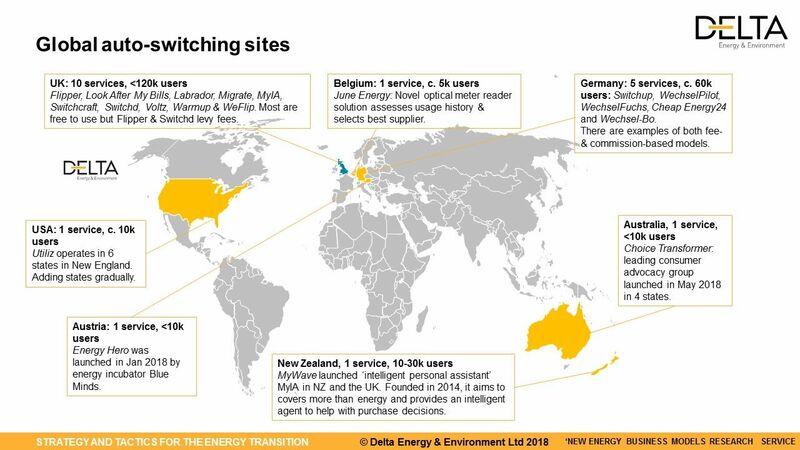 Delta-ee customer research earlier this year showed 45% of European consumers are ambivalent or don't find the idea of an auto-switcher appealing. Further, there are certain market conditions that need to be in place to make the business model work, mainly enough differences in price and proposition between tariffs. Perhaps as more energy markets see new challenger suppliers emerging to rival incumbents, this will come in time? Currently, most energy broker services are unregulated by national regulators, which presents consumer and energy system challenges. We estimate this market to be servicing fewer than 200k customers across EUR – which isn’t many, but neither is it the smallest seen in innovative new energy business models at this stage of market maturity. The fact is, the auto-switchers still have plenty of runway ahead of them. In the energy sector, smart meter data and comparison capability could even combine to give them a central co-ordination role, especially in the deployment of appropriate TOU tariffs. Beyond energy, broadband, mobile and insurance are similarly ripe for disruption - but can one company really be knowledgeable enough about all these industries to help consumers make the consistent right choice for them each time? If so, when? The Delta-ee team has debated on if this will be in 3 or 10 years and for what percentage of the residential market, but this perhaps misses the point. It's a fairly light touch business model if it is simple and it may even help support a competitive market. The more advanced auto-switchers that look to automate and truly assist the customer life are more complex, and tend towards becoming complete home assistants – which should spell concern not only for energy players, but for any incumbent home services provider. To find out more about auto-switching and the six categories of business model, you can contact me via email. Friday, 23 November 2018 Auto-switchers - more than a passing fad? Monday, 02 July 2018 Is investment an indicator of future success?